On this week’s 51%, a Massachusetts artist returns to Armenia to empower women in an ancient art and we tune in to an essay about a lockdown drill. 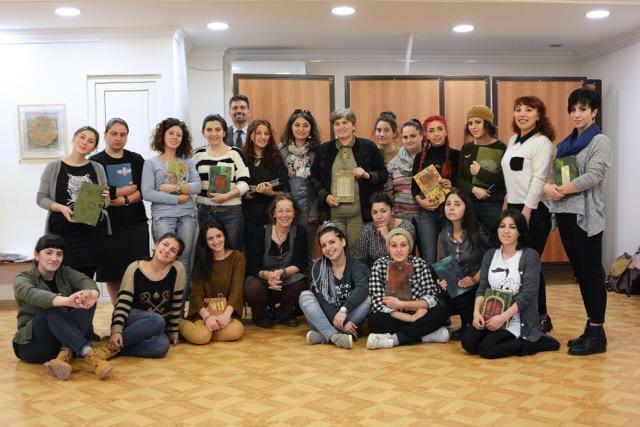 Massachusetts artist Suzi Banks Baum returned to Armenia in November to continue leading her “New Illuminations,” a workshop that introduces Armenian women to the art of book making, an integral part of their culture, but where they have been absent from the tradition. Baum’s workshop empowers women to learn the skill of this ancient art to tell stories of their lives through the books they make, illuminating women’s experiences through contemporary manuscripts. I caught up with Baum before she departed for her third trip to Armenia, second for the workshop and she starts by talking about what happened last time around. That was Suzi Banks Baum, artist, writer and community organizer, who returned to Armenia in November to lead her “New Illuminations” workshop. She resides in the Berkshires region of Massachusetts. I spoke with her around this time in 2016 as she was about to embark on leading her first workshop there. That interview is in 51% Show #1425, online at wamc.org. ALBANY, N.Y. (AP) — A 23-year-old veteran of the U.S. military now serving as the top enlisted leader of the New York Army and Air National Guard is the first woman to hold the position. State officials say Air National Command Chief Master Sgt. Amy Giaquinto became the first Air Guard noncommissioned officer to hold the job of senior enlisted adviser to the top ranked general in the New York National Guard. The position had been held by male New York Army National Guard command sergeant majors since it was created in the 1970s. Giaquinto’s military career began in 1984, with three stints in the U.S. Army. After a 10-year break in service, the Ballston Spa resident joined the Air Guard’s 109th Airlift Wing in Schenectady County. We close the show with an essay from writer Dr. Jeri Burns. Dr. Jeri Burns is a storyteller, writer, and educator living in New York’s Hudson Valley. You can find her at www.storycrafters.com. She also is an adjunct professor in the Department of Communication at the State University of New York at New Paltz.